We ask that you abide by the following Terms of Service, please read carefully before continuing. Violations of our Terms of Service can result in suspension of your account or a permanent ban. 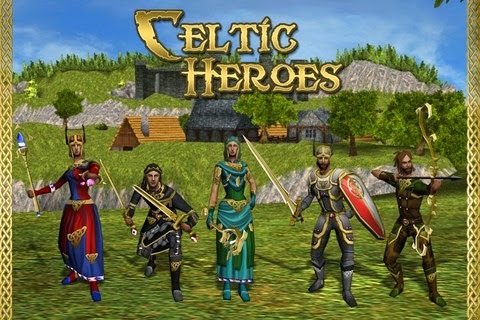 ONE THUMB MOBILE LTD END USER LICENSE AGREEMENT FOR "CELTIC HEROES"
This End-User License Agreement ("EULA") is a legal agreement between you as an individual and One Thumb Mobile Ltd ("COMPANY"), for the software product known as "CELTIC HEROES". The SOFTWARE PRODUCT is protected by copyright laws and international copyright treaties, as well as other intellectual property laws and treaties. As between you and COMPANY, the SOFTWARE PRODUCT is the sole and exclusive property of COMPANY. Your use of the SOFTWARE PRODUCT is solely controlled by this EULA which cannot be changed except by a written agreement executed between you and COMPANY. The SOFTWARE PRODUCT is licensed, not sold. The SOFTWARE PRODUCT is licensed by COMPANY for personal, noncommercial use on your iPhone, iPod Touch and iPad devices, all other uses are prohibited. You must not remove or alter any copyright notices on any and all copies of the SOFTWARE PRODUCT. The licensed granted hereunder is non-transferable. The SOFTWARE PRODUCT is licensed for your use only and only on an iPhone, iPod Touch or iPad that you own or control and as set forth by the Usage Rules in the Apple App Store Terms of Service. You may not reverse engineer, decompile, or disassemble the SOFTWARE PRODUCT, except and only to the extent that such activity is expressly permitted by applicable law.You may not distribute the SOFTWARE PRODUCT to any third party. You may not rent, lease, or lend the SOFTWARE PRODUCT, or offer it for any commercial use or purpose. You are responsible for your own conduct when using the Software Product. You represent, warrant and agree that you will not engage in conduct or communication (written, verbal, or nonverbal) which could infringe or lead to infringement of any copyright, trademark, publicity or privacy right, or any other intellectual property or personal right of any person or entity, is threatening, bullying, defamatory, abusive, obscene, sexually provocative or suggestive, pornographic, or which in any manner could give rise to any civil or criminal liability under applicable law, constitutes spam, violates any local, state, federal or international laws or gives rise to civil liability, is a solicitation or advertisement for inappropriate conduct, commercial product or activity, violates or infringes any rights of third parties including but not limited to copyright, trademark, defamation or any other proprietary right, places an unreasonable or larger than normal load on the game or disrupts any performance of the game, is junk mail, imitation of being a company employee, attempt to obtain other players login information, attempts to hack or crack the product, or anything that the COMPANY regards as harmful to the COMPANY. You agree that there is no expectation of privacy in connection with your interactions with other users in and through the SOFTWARE PRODUCT. You further agree that the contents of any messages or other communication sent from your account, whether in or through chat rooms, direct user-to-user communication, or by other means, is the property of COMPANY and may be accessed, reproduced, and/or distributed by COMPANY as it sees fit. COMPANY will fully co-operate with law enforcement and other governmental entities in policing the content of the SOFTWARE PRODUCT. We may, at our sole discretion, immediately suspend or terminate your access to the Software Product should your conduct, in our sole determination, fail to conform with these Terms. COMPANY may in its sole discretion provide you with support services related to the SOFTWARE PRODUCT and may be reached by email at support@onethumbmobile.com. COMPANY is not required to provide Support Services unless otherwise required by applicable law. You agree not to share your password, buy, sell, give or trade any account, nor attempt to buy, sell, give or trade any account. COMPANY owns, has licensed, or otherwise has rights to all of the content that appears in game. You agree that you have no right or title in or to any such content, including without limitation the virtual goods or currency appearing or originating in the SOFTWARE PRODUCT, or any other attributes associated with an account. COMPANY does not recognize any purported transfers of virtual property executed outside of the SOFTWARE PRODUCT, or the purported sale, gift or trade in the "real world" of anything that appears or originates therein. Gambling is not permitted within the SOFTWARE PRODUCT. You agree not to engage in any gambling activity with real or virtual items or currency. You may not sell in-game items or currency for "real" money, or exchange those items or currency for value outside of the game. You must not under any circumstances share your password with anyone, failure to comply may result in your account being banned. Trading items or gold with another player is entirely at your own risk, COMPANY will not return any items or gold traded between players under any circumstances. The term of this EULA will commence upon download of the SOFTWARE PRODUCT and will continue for so long as you have in your possession or control any copies of the SOFTWARE PRODUCT. Without prejudice to any other of its rights, COMPANY may unilaterally terminate or modify this EULA at any time and for any reason or for no reason, with no notice to you. For example, but not in limitation, COMPANY may elect to terminate this EULA and your rights in connection with the SOFTWARE PRODUCT, if COMPANY, in its sole determination, stops supporting or maintaining the SOFTWARE PRODUCT, ceases to provide updates, no longer offers the SOFTWARE PRODUCT for license, or believes you have failed to comply with the terms and conditions of this EULA. In the event of termination arising from your failure to comply with the terms of the EULA, you must promptly destroy all copies of the SOFTWARE PRODUCT in your possession. As between you and COMPANY, all title, including but not limited to copyrights, in and to the SOFTWARE PRODUCT and any copies thereof, and any content created by you in or in connection with the SOFTWARE PRODUCT (such as, but not limited to the contents of any chats, user-to-user communication, and other text) are owned by COMPANY. As between you and COMPANY, all title and intellectual property rights in and to the content which may be accessed through use of the SOFTWARE PRODUCT is the property of COMPANY and may be protected by applicable copyright or other intellectual property laws and treaties. As between you and COMPANY, all title, including but not limited to copyrights, in and to virtual goods or services that may accrue to you through use of the SOFTWARE PRODUCT, and any copies thereof, whether or not acquired with consideration, are owned by COMPANY, provided for entertainment purposes only for your exclusive use only in connection with the SOFTWARE PRODUCT. These virtual goods or services may not be sold, bartered, or traded without the consent of COMPANY. No property or other proprietary rights in or to virtual goods or services will accrue to you under any circumstances. This EULA grants you no rights to use such content except as expressly and unambiguously set forth herein. All rights not expressly granted are reserved by COMPANY. COMPANY expressly disclaims any warranty in, to, or for the SOFTWARE PRODUCT. The SOFTWARE PRODUCT is provided 'As Is' and 'Where Is' without any express or implied warranty of any kind. COMPANY EXPRESSLY DISCLAIMS ANY WARRANTIES OF MERCHANTABILITY, FITNESS FOR A PARTICULAR PURPOSE, NON INFRINGEMENT, OR CONTINUOUS OPERATION. The entire risk associated with operation of the SOFTWARE PRODUCT is assumed by you. COMPANY does not warrant or assume responsibility for the accuracy or completeness of any information, text, graphics, links or other items contained within the SOFTWARE PRODUCT. COMPANY makes no warranties respecting any harm that may be caused by the transmission of a computer virus, worm, time bomb, logic bomb, or other such computer program. COMPANY further expressly disclaims any warranty or representation to any third party who may operate or otherwise utilize the SOFTWARE PRODUCT. COMPANY can not guarantee the integrity of the SOFTWARE PRODUCT or that it will be free from attacks by third parties that may result in incomplete or erroneous results from operation, or damage to hardware devices in which the SOFTWARE PRODUCT is loaded and operating. To the maximum extent permitted by applicable law, neither Apple nor Any Apple Source is a party to this EULA or your purchase or license of the SOFTWARE PRODUCT. None of the foregoing entities make, have made, and do not make any warranties, or assume any warranty obligation(s) or other obligation(s) whatsoever with respect to: (i) the SOFTWARE PRODUCT; and/or (ii) any claims, losses, liabilities, damages, costs, and/or expenses attributable to the SOFTWARE PRODUCT, including but not limited to any arising from claims of infringement of intellectual property or personal rights, products liability, and/or failure of the SOFTWARE PRODUCT to perform, execute, or conform to any standard. In no event shall COMPANY, Apple or any applicable Apple Source be liable for any damages (including, without limitation, direct, special, incidental, consequential, or punitive damages, lost profits, business interruption, or lost information) rising out of your use of, or inability to use, the SOFTWARE PRODUCT, or the use or inability to use the Software Product by any third party that may have access to the Software Product by or through you, even if COMPANY, Apple, or the applicable Apple Source has/have been advised of the possibility of such damages, and without regard to whether such damages, or claims of damages arise based in contract, tort or otherwise. COMPANY, Apple and the applicable Apple Source shall have no liability with respect to the content of the SOFTWARE PRODUCT or any part thereof, including but not limited to, errors or omissions contained therein, libel, infringements of rights of publicity, privacy, trademark rights, business interruption, personal injury, loss of privacy, moral rights or the disclosure of confidential information. The limitation of liability set forth herein may not be enforceable in certain jurisdictions, or under certain circumstances, as a matter of local law, and is not intended to replace or supercede local law. You hereby expressly and irrevocably waive, and agree never to assert against Apple, or any Apple Source any claims you may have under any theory of law or equity anywhere in the world in connection with rights licensed hereunder, your possession and/or use of the SOFTWARE PRODUCT, and/or the content of the SOFTWARE PRODUCT. Any claims arising out of the SOFTWARE PRODUCT are subject to the limitations set forth herein (all of which are material terms of this EULA) and may be brought only against COMPANY. As a material inducement to COMPANY entering into this EULA with you, you represent to COMPANY that: (i) you are over thirteen (13) years of age, and have the full and unrestricted legal right to enter into agreements; (ii) you are not located in a country that is subject to a U.S. government embargo or has been designated by the U.S. government as a 'terrorist nation'; and (iii) you are not listed on any U.S. government list of prohibited or restricted parties. You acknowledge and agree that Apple and any applicable Apple Source, together with Apple's subsidiaries, are third party beneficiaries of the EULA, and that, upon your acceptance of the terms and conditions of the EULA, any of the foregoing third parties will have the right (and will be deemed to have accepted the right) to enforce the EULA against you as a third party beneficiary thereof. One Thumb Mobile reserves the right to anonymously track and report a user's activity inside of our applications. This information will only be used for analytical purposes and will not be disclosed to third parties.